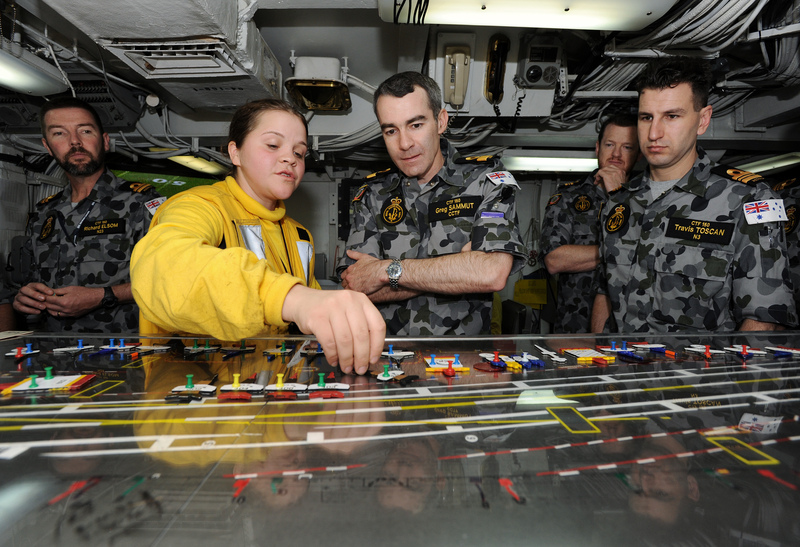 Australian Commodore Greg Sammut, Commander Combined Task Force 150, visited the commanders of both the US and French Carrier Strike Groups currently deployed on operations in the Arabian Sea, 19-20 Dec, 2010. Seizing the opportunity of cross-carrier operations to visit both USS Abraham Lincoln and FS Charles de Gaulle, Cdre Sammut thanked U.S strike group commander Rear Admiral Mark Guadagnini, and French Rear Admiral Jean-Louis Kerignard, for their contributions in support of the CTF 150 mission amid their own commitments to coalition operations in theatre. “The Abraham Lincoln and Charles de Gaulle strike groups have assisted the mission of CTF 150 through their presence in this strategically important region. More importantly, they have directly contributed ships, aircraft, and operational services, significantly enhancing the surveillance and response capabilities of CTF 150 and improving our effectiveness”, said Cdre Sammut. CTF 150 is the counter-terrorism and maritime security mission of Combined Maritime Forces, a 25 nation naval partnership. The principle mission of CTF 150 is to deter, disrupt and defeat attempts by extremist terrorist organizations to use the maritime environment as a venue for an attack or as a means to transport personnel weapons and other materials. It does this by conducting maritime security operations and working closely with coastal states to ensure stability and security in the region. CTF 150 operates across an expansive Area of Operations encompassing some of the busiest seas in the world including the Red Sea, Gulf of Aden, Gulf of Oman, Arabian Sea and northern Indian Ocean. Working in concert with the coalition navies in the Area of Operations, including the French and US carrier strike groups, CTF 150 is working to stop terrorists using the seas to support their land-operations in places like Afghanistan by denying them freedom to move illicit material and personnel to supply and fund their insurgency and other activities ashore.